Although a small country, there are a wealth of attractions in Costa Rica and only the most jaded of travellers could fail to be excited by the plenitude of exciting things to see and do. A whopping 25 percent of Costa Rica is taken up by 75 different national parks, wildlife refuges and biological reserves, making it a paradise for eco-tourism. Adventurous visitors are spoiled for choice with activities like surfing, kayaking, hiking, fishing, white water rafting, canyoning, climbing and zip-line tours available all over this diverse country. For those inclined to relax, Costa Rica boasts truly beautiful beaches and these alone could fill a holiday with sun-tanning, swimming and snorkelling. 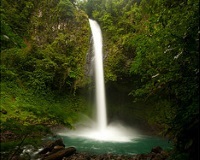 The northwest region of Costa Rica is famous for two particularly spectacular national parks: the Arenal Volcano National Park, with the seemingly perpetually active Volcan Arenal at its heart; and the world renowned Monteverde Cloud Forest Biological Reserve, a unique and awe-inspiring wilderness area that enchants visitors with its mystical atmosphere. Fortuna is a good base from which to explore the region and a visit to the Monteverde community, spread in the hills of the cloud forest, is a fascinating excursion. The Pacific coast is well developed for tourism and is scattered with picturesque villages and great beaches. Jacó is a beach resort town perfect for surfing, sunning and partying in the midst of this wonderful coastline. Puntarenas, the largest town in the region, a popular stop for cruises, is also a good base for exploring the area. The Manuel Antonio National Park is the most celebrated reserve of the region and here you will find a captivating variety of wildlife, as well as the chance to enjoy numerous adventure activities. The Caribbean coast of Costa Rica is becoming increasingly popular; it has a more relaxed atmosphere and is less developed for tourism, but it is a beach haven and the local communities are charming, friendly and happy to share their yummy cuisine and vibey music. Puerto Limon is a bit rundown, but it receives regular cruise passengers and acts as a doorway into the stunning coastal areas and pristine rainforests of Caribbean Costa Rica. Puerto Viejo de Talamanca is a popular tourist destination nestled on the coast. The best parks in this area are the Cahuita National Park, which protects a wondrous coral reef and is a treat for divers and snorkellers, and the Tortuguero National Park, in the north, a famous breeding ground for sea turtles. And in the middle of this natural wonderland of a country sits the capital, San Jose, which is a lively and modern city with good shopping, restaurants and nightlife. It has some architecturally beautiful colonial areas and a few great museums. From this urban centre you can find no end of things to see and do in Costa Rica.